Museo de Antioquia and Concatedral de San Nicolas el Magno de Rionegro are good opportunities to explore the local culture. Get in touch with nature at Piedra del Penol and Mariposario Selva Viva. Explore Medellin's surroundings by going to Rionegro (Museo Historico Casa de la Convencion de Rionegro, Parque Recreativo Comfama Rionegro, & more), Marinilla (Parroquia La Asuncion, Parque de Marinilla, & more) and Envigado (Observatorio Agroecologico El Cafetal & Plaza Pakita). Pack the 19th (Sat) with family-friendly diversions at Parque de Las Aguas. 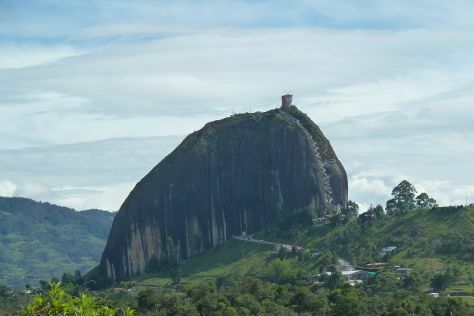 Make the 25th (Fri) an awe-inspiring day at Alto San Miguel - nacimiento rio Medellin. Next up on the itinerary: contemplate the long history of Pueblito Paisa, admire the natural beauty at Jardin Botanico de Medellin, see the interesting displays at El Castillo Museo y Jardines, and explore the activities along Laguna de Guatape. To see more things to do, ratings, other places to visit, and more tourist information, read our Medellin online journey planner . In January, plan for daily highs up to 32°C, and evening lows to 20°C. Cap off your sightseeing on the 8th (Fri) early enough to travel back home.